One of the main ideas that comes forward in Through the Looking-Glass is the gulf between words and the thing they are alleges to mean. Alice’s conversation with Humpty Dumpty on the meaning of the poem the Jabberwocky is a central moment. Although the poem is made up of nonsense words, Humpty Dumpty explains them with great authority. Yet, his explanations make little more sense than the words did in the first place. In addition, as Alice speaks with characters they sometimes transform into something entirely new and different. Although the word for a person’s identity may seem fixed, the person may change into something else. Language and words are completely unstable. While everything is opposite in Looking-Glass World, the very nature of language becomes completely confounded. Throughout Alice’s adventures in Looking-Glass World we know that the game of chess is the underlying principle of order. Alice will become a queen if she makes it to the final square. However, nothing makes any sense and Alice cannot follow the rules of the game in order to properly play. Everything that is happening to her is part of the Red King’s dreams, and we know that she is dreaming. Alice relies on the order and sense intrinsic to chess, but the reality of her experiences defy this order. Alice must learn that all of her preconceived ideas of sense and order are limited when she is confronted with real situations which do not adhere to her own ideas of what makes sense. 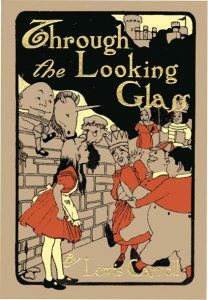 As Alice makes her way through Looking-Glass World, she tries to find help and friendship several times and she is refused repeatedly. As a little girl she believes that others will naturally help her on her way. She finds that this is not the case. As her situation becomes increasingly strange and unmanageable, she is compelled to find her own way and rely on her own wits. The lesson Alice learns is that he adult world can be cruel and unforgiving. The only way to really get through life is on your own, that in the end, we are all on our own.